It's too bad that the new movie "The Lorax" (an adaptation of Dr. Seuss' classic tale) won't be released for another month because today is the birthday of the trees! The 15th day of the Jewish month of Shevat is known as Tu Bishvat and is the official beginning of the "fiscal year" for harvesting the crops in Israel. In the Torah, there is a series of mitzvot (commandments) relating to crops and produce that applies to harvesting in the land of Israel. While many think of Tu Bishvat as a Jewish Arbor Day when everyone plants a tree in Israel, it actually is a day dedicated to feeding the hungry. The Torah legislates that once grains and fruit have been gathered in Israel, there is a mandatory gift called terumah that donated to the Kohen (priest). Following this gift offering, there are ma'aser (tithing) gifts that are required to be given including the ma'aser ani, which is a tithe consisting of 1/10th of the remaining crops to be given to poor. In addition to the tithing requirements, the Torah also mandates that, "When you reap your harvest in your field and forget a sheaf in the field, you shall not go back to get it; it shall be left for the alien, the orphan, and the widow, so that the Lord your God may bless you in all your undertakings" (Deuteronomy 24:19). This is known as the gleanings of the field, or leket in Hebrew. In Michigan, we have a wonderful community food bank called Gleaners that supplied over 40 million pounds of food to soup kitchens and shelters throughout the state. Our family spent the recent Christmas morning volunteering at Gleaners Community Food Bank in Detroit and it was a wonderful opportunity for my young children to learn about the concept of gleaning and our responsibility to feed the hungry among us. In Israel, one of my favorite organizations is Leket Israel (formerly known as "Table to Table"). Every time I visit Israel I make certain to take my group to Leket Israel to volunteer. 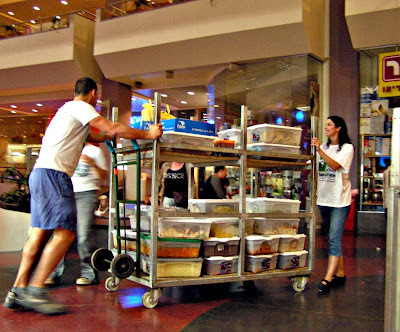 Serving as the Israel's national food bank, Leket Israel is the largest food rescue network and works to alleviate the problem of nutritional insecurity among Israel's poor. Their statistics are staggering: 40,000 volunteers helping to rescue over 700,000 meals and 21 million pounds of produce and perishable goods. Leket Israel supplies over 1.25 million (7,500/school day) volunteer prepared sandwiches to underprivileged children. Today, Leket Israel released its new iPhone and Android applications, which are available in both Hebrew and English. The new apps help the user find the closest food agency to donate any excess food from an event at a catering hall, an office party or a celebration at home. Leket Israel is the first nonprofit in Israel to design such an application. Some U.S. based food banks offer mobile apps to feed the hungry like the Boston Food Bank's Give A Doodle app which lets users donate food by simply doodling a picture of food on their iPhone, Android and tablet touch screens. Leket Israel's Founder and Chairman Joseph Gitler is proud of the new app. He said, "The Leket Israel App will allow both Israelis and tourists visiting Israel easy access to finding the closest location in need of the surplus food from their event. We are very excited to have created the first of its kind in Israel and to use technology to better serve those less fortunate." Both the iPhone and Android versions of Leket Israel's new app are sure to contribute to feeding Israel's growing poor population. On this Tu Bishvat, in addition to raising our commitment to protecting the environment and being thankful for the fruit bearing trees that nourish us, let us also bolster our commitment to feeding the hungry in our midst. Support your local food bank and remember to donate your gleanings to vital organizations near you that are doing important work like Leket Israel and Gleaners Community Food Bank. Leket is one of three agricultural mitzvot having to do with helping the poor. The other two are 'SHIKH'HAH" and 'PE'AH" In the first, the farmer shouldn't go back if he forgot to reap, while in the latter, it is mandatory to leave n unreaped corner in the field for the needy. These three mitzvot, LEKET, SHIKH'HAH, and Pe'ah prevent humiliation on the part of the needy. Tu Bishvat Same'ach!As we know, Ruth benefitted from Leket.